Lyon seems to be experiencing something of a moment right now, what with the likes of Herzog & de Meuron, Kengo Kuma and MVRDV all making their mark on the city. 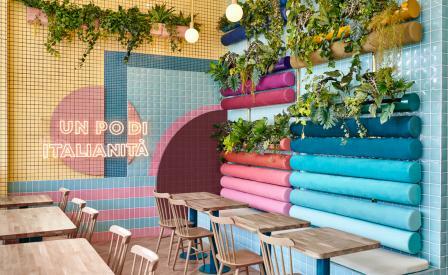 In the Confluence quarter, snuggled inside a mixed-use development, Valencia-based studio Masquespacio, too, is causing a stir with its head-turning interiors for Piada. Cheery pastel hues dominate the space, their light palette given a decidedly grown up mid-century, almost Memphis-esque edge by way of Wes Anderson through tubular shaped back banquettes tipped with cascading pot plants, honeycombed tiles, oval shaped mirrors, geometric colour blocking, and judicious lashings of brass. The main draw, of course, is the titular piadina, both a classic Romagnan flatbread made of flour and olive oil that’s filled with, among other homey ingredients, ham and cheese; and an homage to the owners’ Italian mother – the latter slyly semaphored on one wall in a phrase lit in neon letters that translate ‘a bit of Italy’. Commendably, chef Mathilde Plaza sources her ingredients from Italian and regional suppliers, and offers not just modern twists to a traditional favourite, but also vegan, vegetarian and gluten-free options; though you have to wonder what Mamma, presumably a traditionalist, makes of that.